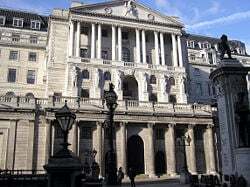 The Bank of England is the central bank of the United Kingdom, and as such it convenes the Monetary Policy Committee, which is responsible for the monetary policy of the country. It was established in 1694 to act as the English Government's banker, a role which it continues to fulfill. The Bank's building is located in the City of London, on Threadneedle Street, and hence it is sometimes known as "The Old Lady of Threadneedle Street." As Britain's role in the world has changed, so has the role of this bank. The United States emerged as the leading power in the world, and globalization has advanced as well as the development of the European Union and the European Central Bank. Although the level of responsibility may have reduced, the Bank of England nonetheless continues to make important contributions in maintaining economic health in the world. Monetary stability means stable prices and confidence in the currency. Stable prices are defined by the Government's inflation target, which the Bank seeks to meet through the decisions on interest rates taken by the Monetary Policy Committee. Financial stability entails detecting and reducing threats to the financial system as a whole. Such threats are detected through the Bank’s surveillance and market intelligence functions. They are reduced by financial and other operations, at home and abroad, including, in exceptional circumstances, by acting as the lender of last resort. Other central banks and international organizations, with the aim of improving the international financial system. The Bank of England acts as the Government's banker, and as such it maintains the Government's Consolidated Fund account. It also manages the country's foreign exchange and gold reserves. The Bank also acts as the bankers' bank, especially in its capacity as a lender of last resort, and to maintain its pragmatic experience in all aspects of banking, which provides commercial and retail banking facilities to a very limited number of corporate institutions and individuals. Since 1997, the Monetary Policy Committee has had the responsibility for setting the official interest rate. However, with the decision to grant the Bank operational independence, responsibility for government debt management was transferred to the UK Debt Management Office in 1998, which also took over government cash management in 2000. Computershare took over as the registrar for UK Government bonds (known as "gilts") from the Bank at the end of 2004. The Bank used to be responsible for the regulation and supervision of the banking industry, although this responsibility was transferred to the Financial Services Authority in June 1998. The bank was founded by the Scotsman William Paterson in 1694 to act as the English government's banker. He proposed a loan of £1.2m to the government. In return, the subscribers would be incorporated as The Governor and Company of the Bank of England, with banking privileges including the issue of notes. The first governor was Sir John Houblon. The Royal Charter was granted on July 27, 1694, and was renewed in 1742, 1764, and 1781. The Bank was originally constructed above the ancient Temple of Mithras at Walbrook, dating to the founding of Londinium in antiquity by Roman garrisons. Mithras was, among other things, considered the god of contracts, a fitting association for the Bank. In 1734, the Bank moved to its location on Threadneedle Street, slowly acquiring the land to create the edifice seen today. When the idea and reality of the National Debt came about during the eighteenth century this was also managed by the bank. By the charter renewal in 1781 it was also the bankers' bank—keeping enough gold to pay its notes on demand until February 26, 1797 when the French Revolutionary Wars so diminished gold reserves that the government prohibited the Bank from paying out in gold. This prohibition lasted until 1821. The 1844 Bank Charter Act tied the issue of notes to the gold reserves and gave the bank sole rights with regard to the issue of banknotes. Private banks which had previously had that right retained it, provided that their headquarters were outside London, and that they deposited security against the notes that they issued. A few English banks continued to issue their own notes until the last of them was taken over in the 1930s. The Scottish and Northern Irish private banks still have that right. Britain remained on the gold standard until 1931, when the gold and foreign exchange reserves were transferred to the Treasury, although their management was still handled by the Bank. In 1870 the bank was given responsibility for interest rate policy. During the governorship of Montagu Norman, which lasted from 1920 to 1944, the Bank made deliberate efforts to move away from commercial banking and become a central bank. In 1946, shortly after the end of Norman's tenure, the bank was nationalized. In 1997, the bank's Monetary Policy Committee was given sole responsibility for setting interest rates to meet the Government's stated inflation target of 2.5 percent. This removed the politically controversial responsibility from the government, and proved popular as showing a sign of the new government's desire for a strong economy. The Bank of England has issued banknotes since 1694. Notes were originally hand-written; although they were partially printed from 1725 onwards, cashiers still had to sign each note and make them payable to a specific person. Notes did not become entirely machine-printed and payable to the bearer until 1855, no doubt to the relief of the bank's workers. Until 1928 all notes were "White Notes," printed in black and with a blank reverse. Times of war, which put inflationary pressure on the British economy, led to greater note issue. In 1759, during the Seven Years War, prior to which time the lowest value note issued by the Bank was £20, a £10 note was issued for the first time. In 1793, during the war with revolutionary France, the Bank issued the first £5 note. Four years later, £1 and £2 notes appeared, although not on a permanent basis. At the start of World War I, the government issued £1 and 10-shilling Treasury notes to supplant the sovereign and half-sovereign gold coins. The first colored banknotes were issued in 1928, which were also the first notes to be printed on both sides. World War II saw a reversal in the trend of warfare creating more notes when, in order to combat counterfeiting, higher denomination notes (at the time as high as £1,000) were removed from circulation. The Bank of England's first ever ten shilling note was issued on November 22, 1928. This note featured a vignette of Britannia, a feature of the Bank's notes since 1694. The predominant color was red-brown. Unlike previous notes, these notes, and the contemporaneous £1 notes, were not dated but were instead identified by the signature of the Chief Cashier of the time. In 1940 a metal security thread was introduced for the first time, and the color of the note was changed to mauve for the duration of World War II. The original design of the note was replaced by the "Series C" design in 1960, when Queen Elizabeth II agreed to allow the use of her portrait on the notes. The ten shilling note was withdrawn following the introduction in 1969 of the fifty pence coin. The Bank of England's first one pound note since 1845 was issued on November 22, 1928. This note featured a vignette of Britannia, a feature of the Bank's notes since 1694. The predominant color was green. Like the contemporaneous ten shilling note, these notes were not dated but were identified by the signature of the Chief Cashier of the time. In 1940, a metal security thread was introduced for the first time, and the color of the note was changed to pink for the duration of the war. The original design of the note was replaced by the "Series C" design in 1960, when Queen Elizabeth II agreed to allow the use of her portrait on the notes. In 1977, the "Series D" design (known as the "Pictorial Series") featuring Sir Isaac Newton on the reverse was issued, but following the introduction in 1983 of the One Pound coin, the note was withdrawn from circulation in 1988. The first Bank of England £5 note was issued in 1793, in response to the need for smaller denomination banknotes to replace gold coin during the French Revolutionary Wars (previously the smallest note issued had been £10). The 1793 design, latterly known as the "White Fiver" (black printing on white paper), remained in circulation essentially unchanged until 1957 when the multicolored (although predominantly dark blue) "Series B" note, depicting the helmeted Britannia was introduced. This note was replaced in turn in 1963, by the "Series C" £5 note which for the first time introduced the portrait of the monarch, Queen Elizabeth II, to the £5 note. In 1971, the "Series D" pictorial £5 note was issued, showing a slightly older portrait of the Queen and a battle scene featuring the Duke of Wellington on the reverse. On June 7, 1990 the "Series E" £5 note, by now the smallest denomination issued by the Bank, was issued. The Series E note (known as the "Historical Series") changed the color of the denomination to a turquoise blue, and incorporated design elements to make photocopying and computer reproduction of the notes more difficult. Initially the reverse of the Series E £5 note featured the railway engineer George Stephenson, but on May 21, 2002 a new Series E note was produced featuring the prison reformer Elizabeth Fry. The initial printing of several million Stephenson notes was destroyed when it was noticed that the wrong year for his death had been printed. The original issue of the Fry banknote was withdrawn after it was found that the ink on the serial number could be rubbed off the surface of the note. The Stephenson £5 note was withdrawn as legal tender from October 21, 2003, at which time it formed around 54 million of the 211 million £5 notes in circulation. The first ten pound note was issued in 1759, when the Seven Years War caused severe gold shortages. Following the withdrawal of the denomination after the Second World War, it was not reintroduced until the Series C design of the mid 1960s produced the brown ten pound note. The Series D pictorial note appeared in the early 1970s, featuring nurse Florence Nightingale (1820-1910) on the reverse, plus a scene showing her work at the army hospital in Scutari during the Crimean War. This note was subsequently replaced in the early 1990s by the Series E note, where the predominant color was changed from brown to orange. The reverse of the first Series E £10 featured Charles Dickens and a scene from the Pickwick Papers (this note was withdrawn from circulation in July 2003), while a second Series E note was issued in 2000 featuring Charles Darwin, the HMS Beagle, a hummingbird, and flowers under a magnifying glass, illustrating the Origin of Species. After the Second World War, the £20 denomination did not reappear until Series D in the early 1970s. The predominant color of this denomination is purple. The reverse of the Series D £20 features a statue of William Shakespeare and the balcony scene from Romeo and Juliet. In 1992 this note was replaced by the first Series E note, featuring the physicist Michael Faraday and the Royal Institution lectures. By 1999 this note had been extensively copied, and therefore it became the first denomination to be replaced by a second Series E design, featuring a bolder denomination figure at the top left of the obverse side, and a reverse side featuring the composer Sir Edward Elgar and Worcester Cathedral. The fifty pound denomination did not reappear until 1981 when a Series D design was issued featuring the architect Christopher Wren and the plan of Saint Paul's Cathedral on the reverse of this large note. In 1990, this denomination saw the start of the Series E issue, when the Bank commemorated its own impending tercentenary by putting its first governor, Sir John Houblon on the reverse. The Bank of England Museum is located on the eastern side of the Bank of England, in London. It covers around 10,000 square feet (1,000 square meters), and includes a reconstruction of a late eighteenth-century office. Known as "The Stock Office," this is where holders of bank stock would come to collect their dividends. The displays cover the history of the bank in roughly chronological order, including many images showing the rebuilding of the Bank in the inter-war years. Another section, called "The Bank Today," uses modern technology to bring the Bank's current activities to a wider audience. The collections include banknotes and coins, books and documents, pictures, furniture, statues, silver, and a gold bar that can be handled. The role of central banks in society is growing. Aside from acting as an equally important branch of government, like its counterparts in the European Union and the United States, the Bank of England is called upon to provide stability to an increasingly global economy. Increasing volumes of international trade means that national currency values and interest rates are critical to more and more people. As globalization grows, so too will the prominence of central banking. ↑ Sale of Bank Note Printing Operations 31 March 2003. Bank of England. Retrieved 2006-06-10. 1694 Act of Parliament founding the bank. History of "Bank of England"
This page was last modified on 11 May 2016, at 14:36.